WA Universal Rigging & Cranes has been a trusted source within the industry for mechanical rigging services WA Universal Rigging and Cranes aims to provide our clients with the ability to complete any job, anywhere at any time. No job is too big, too small, too hard or not possible. If there is no room, no access and the job can’t be done, we will find a way. 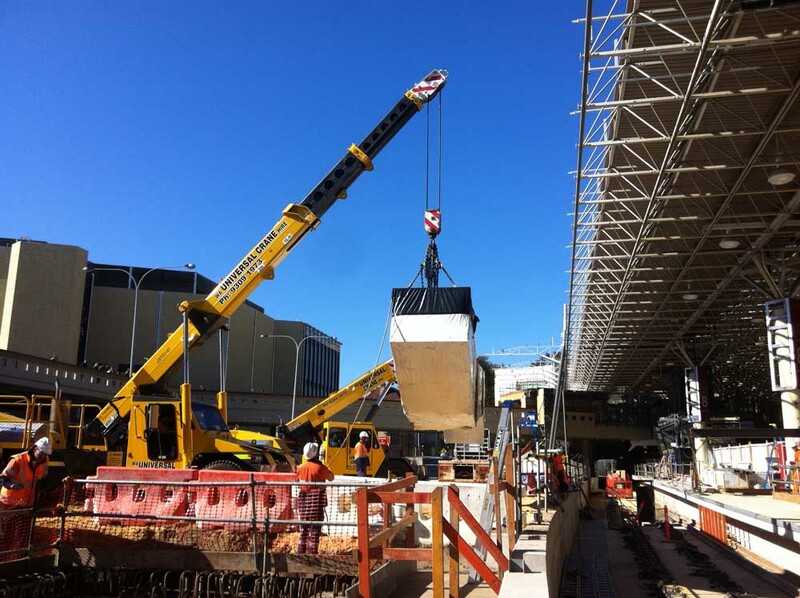 Since our inception, WA Universal Rigging & Cranes been trusted by many of Western Australia’s prominent construction, mechanical, electrical, plumbing, escalator and elevator companies for their lift and shift needs. We offer a complete package, including initial design, engineering, manufacture and supply of specialist equipment, through to the rigging works themselves. We are regularly engaged to shift and install items ranging from pumps, fans, switch boards and chillers up to escalators, moving walkways, CT Scanners and MRI machines. WA Universal Rigging & Cranes has been engaged to move specialist items including the world’s largest gold coin. We are the preferred contractor for the Art Gallery of western Australia to move priceless artworks for exhibits. WA Universal Rigging & Cranes is a trusted installer for escalators and moving walks for Schindler, Kone and Thyssen Krupp with the ability to design and engineer an installation method to suit any location, no matter how restricted access is or what access restrictions are faced onsite. WA Universal Rigging & Cranes can offer a one stop shop for design, transportation, traffic control, engineering, permits and installation for your next project.